The long term care of your pet can be a challenge, to say the least. As your pet grows older, his healthcare needs will only increase. By bringing your pet to Vet Med Animal Hospital in Lafayette, you benefit from the help of highly-trained veterinary specialists in their field. We offer a wide range of pet care services for dogs and cats, making it easy to for you to keep up with their health and wellness needs. Led by Dr. Scott Tate, your Lafayette veterinarian, our animal hospital has been serving Lafayette pet owners with quality veterinary care for over 20 years. Dr. Tate specializes in pet surgery, but has ample experience in pet medical procedures and emergency care. Dr. Tate and our team of animal caregivers are fully committed to looking after your pet’s health and wellbeing. Here we treat pets large and small, providing each with professional, conscientious care. Whether you’re bringing your pet in for a pet wellness exam, heartworm treatment, or microchipping, we’ll give your pet the prompt, efficient services he needs. We combine professional services with personalized care to establish a lasting relationship that will benefit both you and your pet over the years. As preventative care is the basis for keeping your pet healthy throughout his life, your Lafayette veterinarian offers an array of preventative care services to include pet wellness exam, heartworm treatment, parasite control, spay and neuter procedures, vaccinations, and nutritional counseling to protect your pet against sickness and disease. We have at our disposal the latest in diagnostic equipment to include digital radiology, a full in-house lab and EKG to provide quick and accurate diagnosis of your pet’s health condition. We also operate an in-house pharmacy capable of providing all the medications your pet needs to recover from a health condition or surgery. We offer comprehensive pet dental care to include dental exams, pet dental cleanings and dental treatments to enhance your pet’s oral health. Your pet needs healthy gums and teeth for eating, playing and personal protection. Microchipping your pet makes it easier for you to find him if he’s stolen or separated from you in a crowd. We offer safe, effective microchipping services to protect your dog or cat. If you’re going away on business or pleasure and can’t take your kit or pooch along, pet boarding offers a viable alternative. We’ll provide your pet with clean, comfortable quarters to stay in and care for his every need. Pet boarding is the perfect solution to keeping your kit or pooch safe and happy while you're away. To visit our facility or consult with our vet, contact Vet Med Animal Hospital in Lafayette at 337-456-8010 today. At Vet Med Animal Hospital, we treat your pets like the valued family members they are. Dr. Tate grew up in Kaplan, La. He attended LSU and received a Bachelors of science in Zoology in 1990 and Doctor of Veterinary Medicine in 1994 . Dr. Tate has a vast variety of experience in medicine, surgery and emergency care for small and large animals. He enjoys orthopedic surgery and performs a variety of procedures including cruciate surgery and bone implants. 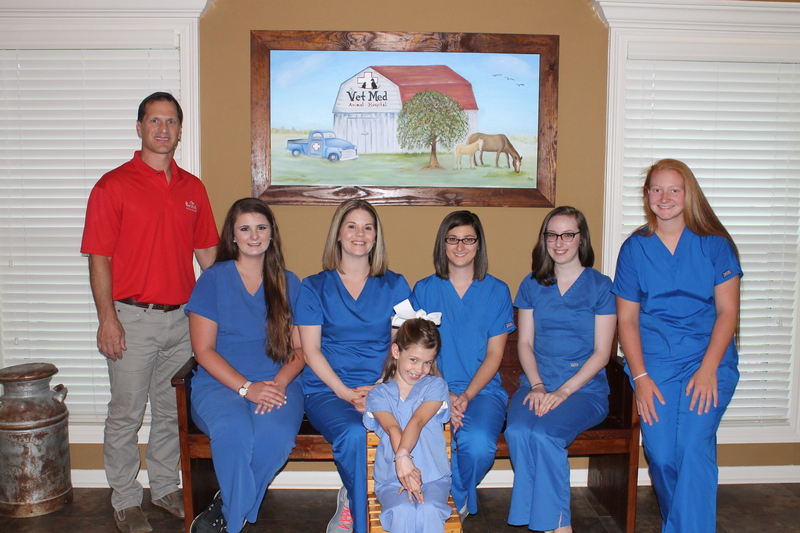 He has provided veterinary care for pets in Lafayette and the Acadiana area for over 20 years and is a member of the Acadiana Veterinary Medical Association. Dr. Tate enjoys exercise, spending time outdoors, LSU sports and working at his camp. He lives in Lafayette with his wife Beth and daughter Gabrielle. Sayra is a certified medical office assistant. She shares her home with her husband, 2 children and her pit bull, Zeus. Alicia is a certified veterinary assistant. She spends her spare time with family and her Australian Shephard Titan. Kera is a LSU college student pursuing a career in Veterinary Medicine and shares her home with a Catahoula Leopard Dog named Emma. Catherine is a Texas native and is a Certified Veterinary Technician that shares her home with two Labs named Beau & Duke, four cats named Harley, Luna, Tux and Tootie. Stacey is a recent high school graduate, and an avid animal lover who shares her home with Labrador Retriever named Moose. "Love this place! They always treat my chihuahua Oliver like he's their own! Dr Tate is so kind and knowledgeable, and answers all of my questions. Would recommend him to everyone"